Dr.Siva Kumaran a fresh homoeopath, graduated from government Homoeopathic Medical College, Tirumangalam enthusiastically involves with the patients. 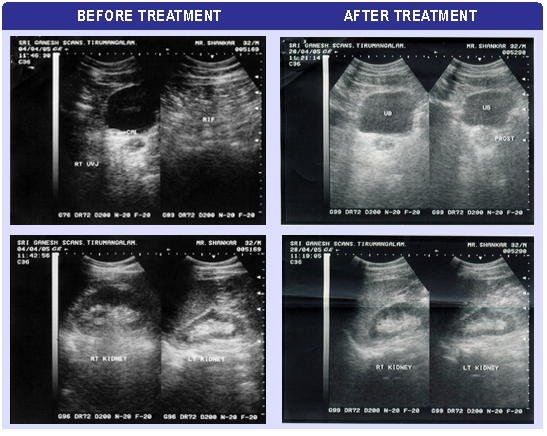 Here he explain’s a case of acute renal colic treated with Lycopodium. He also emphasizes the use of Phatak Repertory. A male patient aged 32 years consulted me with agonizing pain in right iliac region. He persuaded me to prescribe some medicines to get rid of the pain immediately. He was not in a position to explain any thing. The patient does not want to lie down in casualty His mother in law who was a female medical assistant showed the scan report, which was taken on 2/04/2005. I observed that the patient was in distress and I could not establish any other symptom. Just I referred the Phatak Repertory. I referred Materia Medica and final choice of the remedy was Lycopodium.I prescribed Lycopodium 1M-singledose with aqueous solution, which was repeated frequently. Surprisingly patient slept comfortably after ten minutes. No pain at all afterwards. After four days the patient came with stone and showed it to me with great pleasure. We remember the grand generalization of Boeninghausen, towever I feel the value of Phatak repertory mainly in acute cases, particularly to the patients with clinical reports, acute crisis and dumb patients.